I promise i did not photoshop the color on this image. 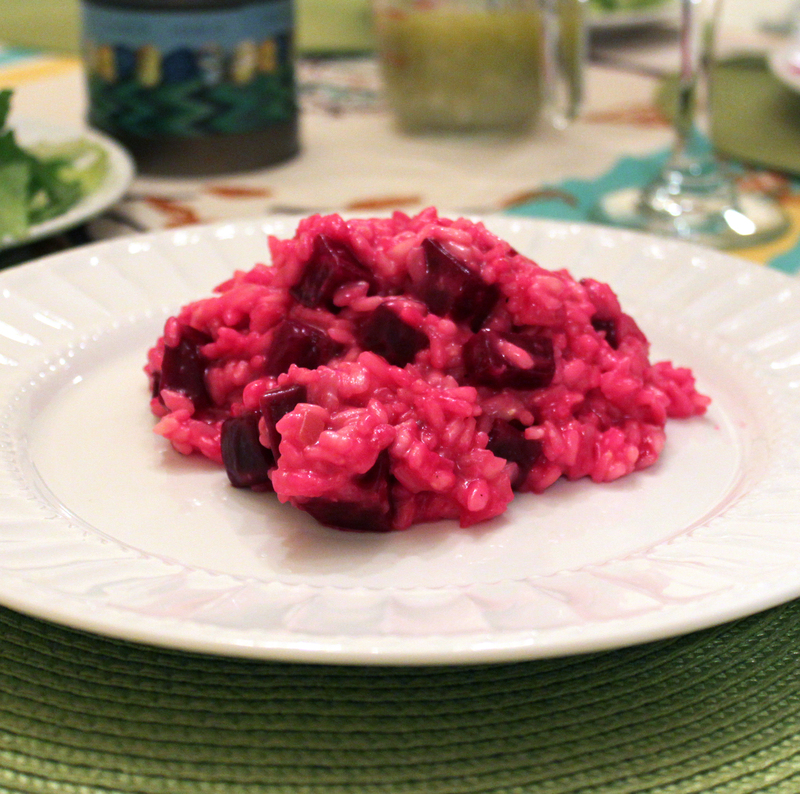 The risotto really is that shockingly pink! This recipe is only moderately tweaked from Gourmet.com. Even though I eat it often, this is my first time making risotto and I was nervous. Joe is a risotto master. Luckily the condo we are staying in on St.Simon’s Island has only nonstick pans, so i could be a little less attentive than at home. Add wine and simmer briskly, stirring constantly, until absorbed, about 1 minute. Stir in 1/2 cup broth and simmer briskly, stirring constantly, until broth is absorbed. this was such a treat. this salad was like candy! i have read somewhere that eating avocado with other foods helps your nutrient absorption. i wish i had allowed a good hour and fifteen to prepare all the ingredients (mainly the beets), because i was pressed and had to cut corners (turned up the oven). to make dressing, mix together balsamic vinegar, evoo, and onion in medium sized bowl. toss beets in dressing and let marinate while the oven heats up. bake beets for 25 min, then flip and bake another 20 min, or until soft through. heat canola oil and brown sugar (and a tiny pinch of cayenne pepper) in medium saucepan with walnuts. keep stirring as the sugar caramelizes and begins to coat the nuts (about 5 minutes).